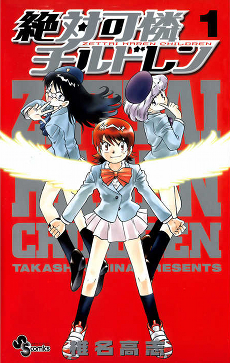 Zettai Karen Children (絶対可憐チルドレン Zettai Karen Chirudoren?, lit. Absolutely Lovely Children) is a Japanese shōnen manga by Takashi Shiina about three young problem girls with outstanding psychic powers and a young man with no special powers at all tasked to guide them properly while dealing with all the commotions they cause, including their obvious infatuation on him. The manga started being serialized in Shogakukan's manga magazine Shōnen Sunday in 2005. An anime series by SynergySP, titled Psychic Squad in North America began on April 6, 2008 which ran for fifty-one episodes and had a special OVA released in July 16, 2010. A spin-off focused on main antagonist Kyōsuke Hyōbu titled Zettai Karen Children: The Unlimited animated by Manglobe began airing on January 7, 2013. Sana ipalabas na ito. Dapat kapalit ng Spongebob. Still hoping na sana ipalabas na ito. I-rename na lang kaya yung Absolutely Lovely Children bilang Psychic Squad?